Hogg earned a call up to the Scotland squad for the 2012 Six Nations following a series of impressive performances for Glasgow. 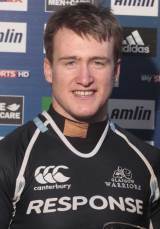 Hogg can play at stand-off, centre or fullback and has played for Scotland U17 and U18. His brother, Graham, has played for Scotland in the IRB Sevens World Series as well as representing his country at U18, U19 and U20. Their father, John, played for Hawick before becoming a referee while he is also a distant relative of legendary footballer George Best. Hogg's early international appearances varied in quality and it was not until the 2013 Six Nations that he really made an impact. Behind an improved Scottish pack and a more creative backline, Hogg scored two tries in the tournament and impressed all-round to catapult himself into the British & Irish Lions squad to tour Australia. Hogg did not feature in the three Tests against the Wallabies but he was an important squad member as the Lions claimed a first Test series triumph in 16 years. The highlight of his tour was a Man of the Match performance against the Combined Country XV, in which he scored a try from the unfamiliar position of fly-half.